Time for another post about some of my favorite projects from Primitive Christmases Past. 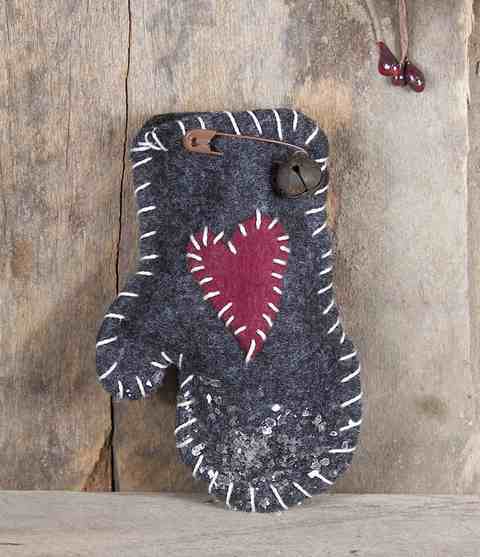 My last post was about Primitive Christmas Mitten Ornies. 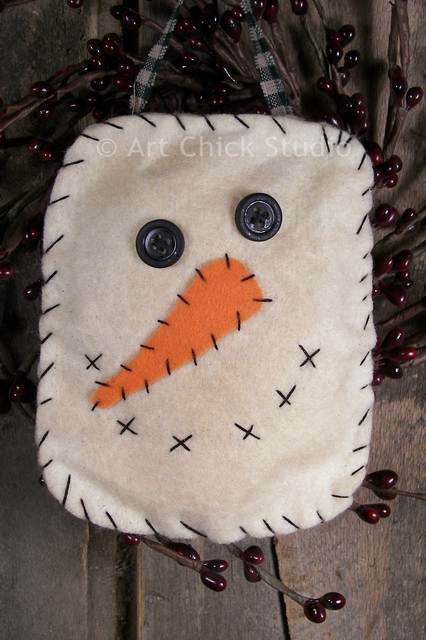 This one is just about favorite craft projects for Christmas in general. This first one is a primitive ornie that I see all the time on Pinterest, so I must have done something right with it. I had actually made it to post on my Art Chick Studio blog in 2010. But after I finished it, it looked rather prim to me, so I posted here too. Any of you who have followed my blog for awhile, you know I don't much care for sewing. But this kind of project is small enough that it doesn't get the better of me. And it's less stress too because it's prim--so I know it doesn't have to look perfect to be prim! In 2013, I decided to make a mini Primitive Christmas tree out of a cinnamon stick and homespun. I'd seen other prim crafters do something similar with a cinnamon sticks, so I wanted to give it a try. It's probably the smallest and easiest little tree I've ever made, and I think it turned out super cute. 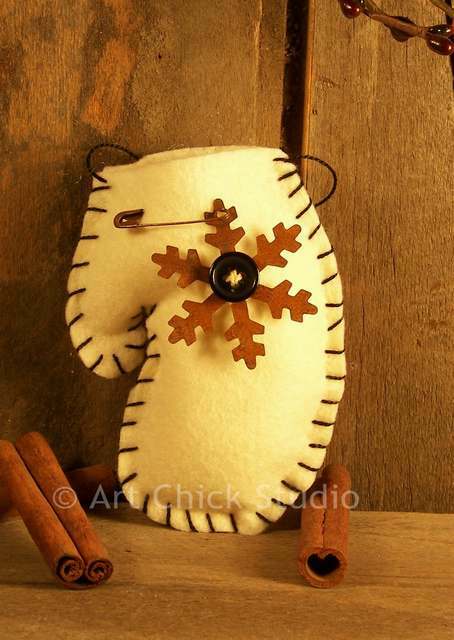 How about this grungy primitive reindeer ornie from 2011, made from a muslin bag? Look, he even has pip berries for antlers. How cute is that?! 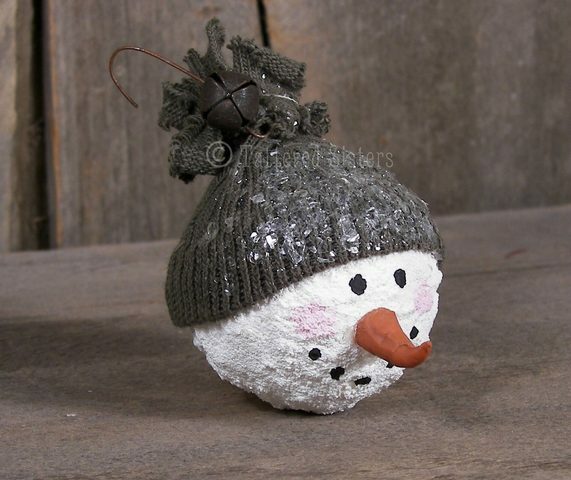 And hey, let's not forget about my Primitive Snowball Face Ornie from 2010. I had so much fun making this. actually made quite a few of them for an ornie swap I joined that year. It was really fun though and I love the little carrot nose, and the hat made out of a baby sock! So there's my little treasury of Primitive Christmases Past. I hope you liked the little stroll down holiday memory lane. And I hope you are on Santa's Nice List this year so that he will bring you lots of wonderful Christmas goodies. Ho-ho-ho!